Rosemary Hill of Romsey became the youngest ever conductor in the history of the event when she lifted the trophy in the call-change section of the W&P Winchester District annual striking competition on the five at Brown Candover. 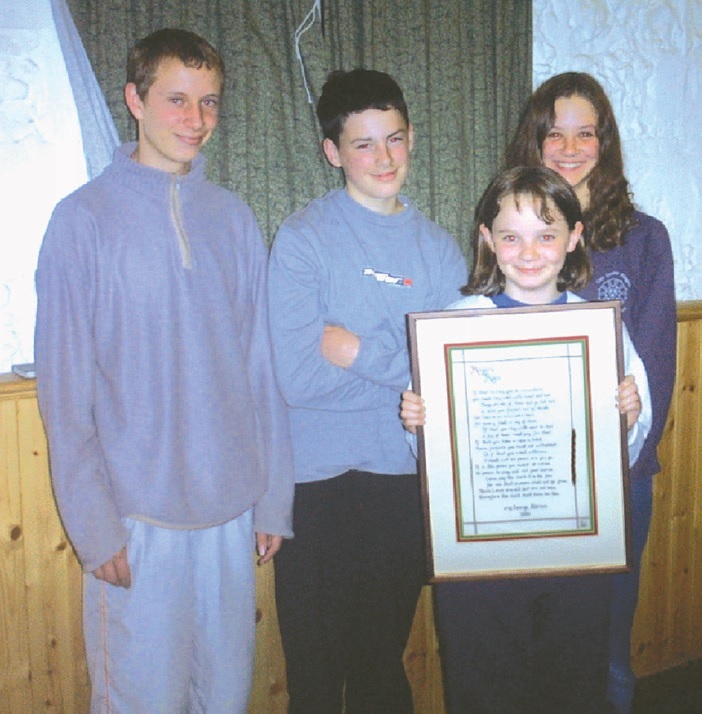 Rosemary led Hursley "B" comprising mum Christine (herself something of a bob caller), elder sister Katie (12), Neil Saunders (14) and Stephen Thompson (16). Although only ten in April the diminutive Rosemary possesses both the loud voice and clear head required for call changes which were judged by Chris Caryer of Andover. Second place went to the band from Romsey Abbey which included four members of the Daniels family. It was a particularly good day for the Hursley ringers and the Hill family in particular as dad Peter captained the Hursley "A" team to victory in the method section at nearby Preston Candover (judged by David Forder), beating off the challenge of arch rivals Winchester Cathedral (who gave Hursley's Bob Doubles a sporting chance by ringing Cambridge) with New Alresford third and Winchester Cathedral Girls fourth. This was rather a Grand National of a competition with a third of the bands failing to finish on these light (3cwt) bells. At the quarterly District meeting which followed the competition, the trophies were presented by District Chairman Philip Gorrod who reported on plans to improve communication through the district website and email, and promised to re-establish traditional ringers' teas as the norm after an experiment with lighter bites (tea and biscuits). Details were also given of a quarter peal fortnight, the annual outing (to Guildford) and next season's striking league. The day concluded with ringing at Old Alresford and a pint or two at the Flowerpots at Cheriton.